Mind you this may not be as useful to the millions of smartphone users out there, but check out BeerText.US, an innovative beer reference service that delivers descriptions of specific beers right to your phone. 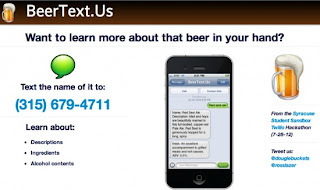 The service is simple - just text the name of a beer to BeerText.US's number and it will shoot you back a description, its ABV, and other facts about the brew you are considering. There is no signing up for the service or convoluted pricing scheme. It's all free, with the exception of whatever your cell company charges you for texts. The service comes from a pair of students from my old alma matter, Syracuse University, where it was put together as part of a hackathon. All the beer information is pulled from BreweryDB, an open beer database API loaded with beer information. But with all the variety of beer out there, if you find a beer not in their system, simply add it. When I test drove BeerText.US, it found most of the beers I was looking for, but it did get stumbled once and a while. The information usually came back in 10-15 seconds in multiple text messages. Sometimes the text messages would arrive out of order (i.e. 2 of 3, 1 of 3, and then 3 of 3), but the information was still fun. 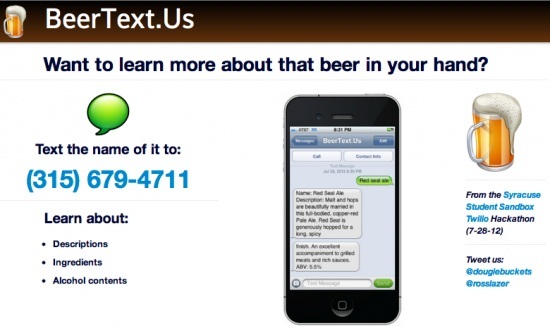 I could see how this could be real useful for someone without a smartphone, but for the for those of us in the iPhone/Blackberry world, it would take just as long to google a new beer as it would be to send out a text. Give the service a try, if nothing more for the novelty of it. And then let us know what you think. "Work is the curse of the drinking class"